President Ram Nath Kovind arrived in Croatia on a four-day visit, becoming the first-ever Indian head of state to visit the country. 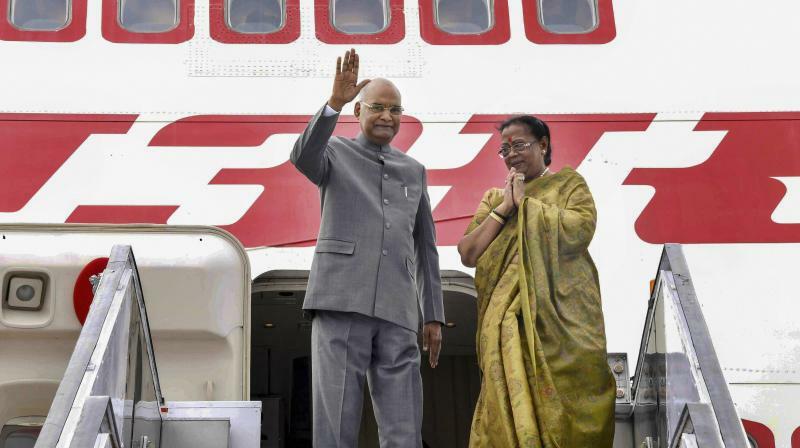 Zagreb: President Ram Nath Kovind arrived in Croatia on Monday on a four-day visit, becoming the first-ever Indian head of state to visit the country. He is accompanied by First Lady Savita Kovind on the first leg of his eight-day three-nation visit to Croatia, Bolivia and Chile as part of efforts to further strengthen bilateral ties between India and the three countries. Kovind was welcomed by Anamarija Kiriniae, Chief of staff from the Croatian President Office, on his arrival at Franjo Tudman International Airport at the Croatian capital of Zagreb. "#presidentkovind and First lady arrive at FranjoTudman International Airport #Zagreb #croatia on their first leg of visit to three countries State Visit. Ms Anamarija Kiriniae, Chief of staff from the Croatian President Office welcomed them along with other dignitaries," Ministry of External Affairs spokesperson Raveesh Kumar tweeted. It is a first-ever state visit undertaken by President of India to Croatia and Bolivia, he said in another tweet. In Croatia, Kovind will meet his Croatian counterpart Kolinda Grabar-Kitarovic and Prime Minister Andrej Plenkovic. "India and Croatia are now focussing on strengthening trade and investment linkages," according to a MEA press release.